Jonathan Mitchell Photojournalist Author | Notes, photos and general ramblings of a has been writer! Notes, photos and general ramblings of a has been writer! 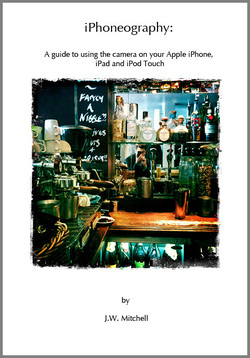 IPHONEOGRAPHY: A guide to using the camera on your Apple iPhone & iPod Touch 2 now reduced in price to US$2.99! Some good news for those of you who are looking to sharpen up their iPhone photography skills, my ebook guide to taking pictures with your iPhone (upto about the iPhone 4 – though the advice contained inside is still useful and relevant) – IPHONEOGRAPHY: A guide to using the camera on your Apple iPhone & iPod Touch 2 – has now been reduced in price to just US$2.99*. This is largely due to the ebook being slightly out of date, just a few year’s later, as we now have the iPhone 6. I do intend to be soon writing another, more up to date ebook about iPhoneography (i.e. photography with Apple iPhones) as the iPhone now has more powerful capabilities. This opens up more possibilities on these devices and therefore requires me to write a new guidebook on iPhoneography. *Depending on where you buy on the iTunes store in some countries prices may be higher due to local taxes. NB The following article is an extract from a series of essays I am in the process of writing about UK politics, please check back to this blog for links to the publication of the eBook in a few weeks. Revolutions are rare in these isles (Ireland excluded!). Napoleon passed us by, Hitler got a bloody nose, the KGB thwarted. The last civil war was four centuries ago and about the most radical thing we have ever done is take on the Protestant faith as our national religion. The United Kingdom is synonymous with tradition, stability and Dickensian poverty. With not a shot fired, a barricade manned, the issue of Scottish Independence has created one of the most fascinating political landscapes for centuries. Many south of the border – including many Scots who have settled in England – almost view Alex Salmond as some kind of traitor. Those unruly Scots don’t know their place and are being, well, unruly again – is a common attitude. Others, like jilted lovers, say to hell with them. Few though, as is perhaps a background national characteristic, see the positive things that are emerging from the efforts of nationalist Scots to win the referendum which decides if they become an independent state in September 2014. Which is a shame. Royalists and unionists have been very busy denouncing the idea. Pushing the ‘No!’ accentuating the negative. Scotland, they say, will face dire peril if it splits, the economy will be ruined, Scots will be worse off, etc, etc. These are of course, sadly, the politics of fear. Endless opinion polls appear to indicate that a ‘no’ vote is likely. Though when you look more closely, it seems the opinion polls are wide of the truth. 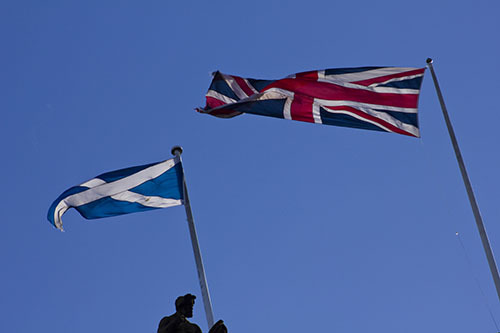 The biggest reason that Scots are likely to vote ‘yes’ is not what comes out of the Scottish nationalist politician’s mouths, but rather the quagmire that is the UK political scene – i.e. Westminster is the reason why a ‘yes’ vote seems likely. New Labour are desperately backing the ‘no’ campaign with it’s cheesy ‘better together’ campaign, led by Alasdair Darling, which is often to be heard issuing dire forecasts about the post-apocalyptic world of an independent Scotland. The main reason for this is Westminster. New Labour don’t really give a hoot about the issue or Scotland, rather the post-independence layout of seats in the Houses of Parliament in Westminster. An independent Scotland makes a majority at Westminster very difficult. If New Labour had the political equivalent of a kitchen sink – which they do not – then they would doubtless hurl it at the ‘yes’ camp. Thus far, the only kitchen sink that Ed Milliband has pulled out of the shed is the oft-repeated Millibandism of ‘one nation’. Though it may force the New Labour mob to actually think up some policy if – as appears likely – they have to scuttle back to English redoubts. In addition, the arguments put forward by the pro-union camp smack of desperation. None of them really stands up to serious analysis and are not likely to convince many Scots. The dewy-eyed nostalgic types who cling to the present system are mostly those who confuse it with their greater patriotism to the United Kingdom. This camp has dwindled somewhat is was never all that large in the first place. And when there is little evidence to suggest, that with Queen Elizabeth II staying on as head of state, that an independent Scotland would be any different in that regard, save perhaps getting involved in badly-planned invasions of countries in the Middle East and seemingly aimless wars in places like Afghanistan. Interestingly, the Tories are in something of an embarrassing position. While David Cameron has unconvincingly stated his pro-union position, this has little or no effect on Scotland, where Scottish Conservatives are something of a protected species. This comes across to many in Scotland as that some millionaires are unhappy about independence. Behind the scenes, as Larry the Chief Mouser may tell you, the situation is somewhat more complex. Conservative strategists doubtless are jumping with joy about a ‘yes’ – as it damages New Labour. On the other hand, stick on the national anthem and they all go dewy-eyed. Really, it is a shame no one listens to them in their more radical guise, as from the Conservative party’s point of view – while Mr Cameron has been open-minded on the issue, it is better perhaps for them to back it, as it looks like a given anyway…In other words, they are flogging a dead horse by backing the ‘better together’ unionist camp. Such a position may prevent the extinction of the Scottish Conservative Party, which while unlikely to win the next few elections, may be a necessary counter balance in this new democracy. Amusingly, perhaps the biggest force upon undecided Scots, who appear to be increasingly warming to Scotland becoming an independent state, is the true disaster zone which is Westminster politics. Nothing perhaps strikes fear through the glens like the outbursts of UKIP, Milliband’s fuzzy policies or the callous ideologues of the post-Thatcher Tory party and the fairly clueless Cameron administration or the sheer political fluff which constitutes Nick Clegg and the Liberal Democrats. But imagine that come the autumn of 2014 it is a ‘yes’ and Scotland becomes once more (as it was pre-1707) an independent country. Aside from the obvious benefactors, the side-effect of this earthquake in UK politics is that English, Northern Irish and Welsh politicians may well have to formulate policies which are not wholly for the benefit of a narrow, moneyed social strata. Chatting with people over the issue in Edinburgh in 2011, I was told how the chattering classes there always said there would never be a Scottish Parliament, that the Scottish National Party would never win a majority if there was a Scottish Parliament and now, lo, that independence will never happen. -ends- © 2013 Jonathan William Mitchell. All Rights Reserved. 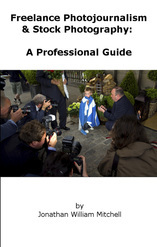 This ebook gives great insight into the business (of which I have over two decades experience) and good advice on how to manage your finances and build up your portfolio and equipment. Plus insights into how to distribute your resulting stock collection and much more. As I recently deleted the site I built for this ebook (and my three other titles), I will now be posting some posts on this blog in the future to enhance the information provided in my book. CANNOCK CHASE, Staffordshire, UK — 6th October, 2013 — JUST under a century ago, this now quiet, leafy, beauty spot in south Staffordshire was a hive of military activity. For the staff officers of the the newly-formed New Zealand Rifle Brigade at Brocton Camp, their small, tennis court sized battlefield map outside their headquarters was a great source of pride. And not without reason…For it depicts one of the most awesome and decisive confrontations of World War I, the Battle of Messines, in which they fought with great valour. Some 95 years later, a similar pride infuses the hearts of Staffordshire County Council’s archaeological department – who located the giant model in September. After some weeks of careful excavation, the extensive remnants of the model of the battlefield of Messines are now fully excavated and have been laser scanned to create a 3D computer model of the battlefield at Messines as it appeared in the spring of 1917. “This is an excellent survival and is unique,” says Stephen Dean, the Principal Archaeologist from Staffordshire County Council’s Archaeology Department. His team of archaeologists have spent the past four weeks or so carefully excavating the model, which was rendered in concrete. What they have uncovered has survived the ravages of ten decades…The enemy of the archaeologists being the roots of trees and brambles, frost, damp and rabbits – a warren has destroyed a small part of the site. Nevertheless, the surviving parts of the battlefield model are still an extraordinary find and Mr Dean says they will yield a whole host of fascinating insights into The Great War – the centenary of which begins in 2014. “It tells us potentially what the trenches actually looked like,” Mr Dean says. Adding that very little is known from current sources about secondary trench systems. “It appears the New Zealand Rifle Brigade depicted all primary and secondary trenches in detail, whereas on the army maps only the primary trenches are drawn in detail,” he adds. Made at a scale of roughly 1:50 on the horizontal and 1:25 on the vertical (to accentuate the ridge), the detail in the model is extraordinary. It is aligned perfectly to the compass and in total measures 35 x 40 metres. Tiny pebbles in neat lines show the contours of the Messines Ridge. Built in 1918 by officers of the 5th Battalion of the New Zealand Rifle Brigade (NZRB) with the aid of German prisoners of war, it depicts all the German primary and secondary defensive trenches, roads, railways (one in a trench), artillery and machine gun emplacements, the British Army front lines in the NZRB sector and the – mostly ruined – town of Messines. Archaeologists are still puzzling over the details of the model, but one interesting detail they have discovered is a building in the town shows a fortified cellar! Large scale battlefield models were widely used by the General Staff of the British Army in World War I and two similar models of the Messines Ridge were built at regional headquarters in Flanders before the Battle of Messines in June 1917. However, the example discovered at Cannock Chase is the only one that still exists, as the ones made in Belgium and France were made of compacted earth and have since ceased to exist. The model may also show where some British Army regiments were deployed in the network of trenches. “There may be part of trenches of the Cheshires and the Worcesters…But we are not entirely sure at the moment,” Mr Dean said. Now the site has been fully recorded by the archaeological team, it will be covered with a root-proof barrier, covered in sand and then covered in a rabbit-proof barrier, before the spoil is returned and the site is allowed to blend back in with the heathland common to Cannock Chase. A key battle of World War I, the Battle of Messines spectacularly began at 3AM on the morning of the 7th June, 1917 with nineteen huge explosions from large mines planted in tunnels underneath the German front lines, killing thousands in a single moment. The NZRB were ordered to take Messines and one Lance Corporal, Sam Frickleton, was awarded the Victoria Cross for destroying two machine gun nests near the Institution Royale on the outskirts of the town. Total German casualties were approximately 26,000 versus 20,000 British, Canadian, Australian and New Zealanders. The victory on the Messines ridge paved the way for larger battles at Ypres and Passchendaele. The survivors of the 5th Battalion of the NZRB returned to their base at Brocton Camp on Cannock Chase in 1918 and built the model ostensibly for training. Stephen Dean says it would have been used to explain tactics to new officers and non-commissioned officers and some soldiers heading out to the Western Front. These models he says had advantages over the paper maps, which were full of codes and symbols only certain officers understood. Note on this story: Despite a lot of interest before I did the 200 mile round trip to cover, it…Not one UK national newspaper ran this story or any of the pictures…Sadly, the following Monday…Some nonsense about Downton Abbey was of course, of much greater importance! Welcome to my new photojournalism and writing blog! This has replaced my old web site which failed utterly to gain me any work or commissions. I am a fortysomething has been photojournalist. Ruthlessly spat out by most of the London and Edinburgh newspapers, I now mostly just drink Scotch and rant about world affairs. Sometimes, when sober enough, I go out and take beautiful photographs, which I then file into indifferent photo agencies who care not if I am well-stocked with single malt whisky! Such is the shocking world of British journalism. Hence, I decided that I should establish a blog to publish all those stories I work on which do not seem to tickle the high and exacting standards of Her Majesty’s Press. I hope you find some of them interesting and amusing. And oh! You will also find links to my published ebooks here too…Slainte!